De ser meget tiltalende ut. Gode spillere vil her få køller som det er vel verdt å vurdere. Ping har i over 50 år lagd godt golfutstyr. Nå kommer de nye blades-jernene. De nye Ping IBlades er etterfølgeren til den populære S55-modellen. Golfsiden har ikke fått testet dem foreløpig. PHOENIX (August 1, 2016) Through extensive research and observation of leading tour professionals, PING engineers designed the new iBlade iron for golfers who rely on the precision and control to execute the most demanding shots in the game. 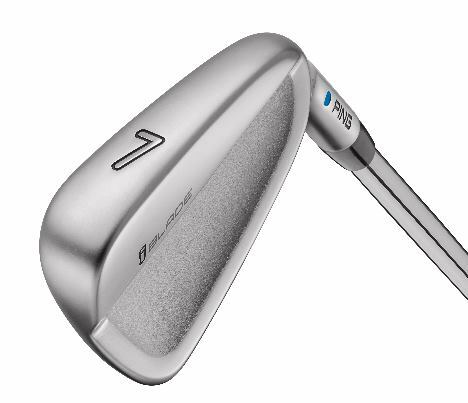 The blade-style iron follows the highly popular S55 model, which has amassed more than 50 wins around the world since its introduction over two years ago. The body is precision cast from soft, high strength-to-weight ratio 431 stainless steel. The result is the softest, purest feel ever in a PING iron. With the workability to shape shots on command, the compact iBlade iron head delivers consistently precise distance and trajectory control that surpass skilled players’ expectations. Forgiveness is also factored into the design. Nearly "pure" tungsten weights (netting a 70% increase in mass relative to the S55 iron) are pressed into the toe of every head to increase the MOI – a key factor in the precision of the iron.